The mounting evidence about the economy and the consumer is now undeniable. For example, we’ve covered the drop in business dining and traffic in premium steakhouses Ruth’s Chris and Del Frisco. The drop in business travel from places like Marriott Hotels – which reported their top 300 corporate clients cut room bookings by 10%. And business meetings to travel-in destinations like Las Vegas – where Las Vegas conferences and meetings dropped 24% year-over-year (yr/yr) in August. In fact, year-to-date, the number of meetings in Las Vegas have risen a meager ~5%. These are all signs of corporate belt-tightening on discretionary spending. Companies have also been cutting down on more long-term, business-impacting investments like capital goods. 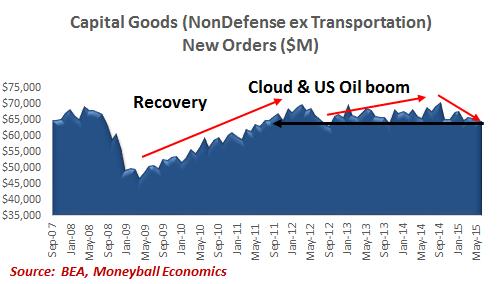 The metric that tracks this spending is Capital Goods New Orders (Nondefense, ex Aircraft). Spending on capital goods is very cyclical, meaning that it tracks the ebb-and-flow of the economic cycle. In this chart, note a few things. First, there’s the post-recession boom (given an extra boost from Bush-era tax credits). Growth slows because of the emergence of the “Cloud” and the way it enables companies to sharply cut information technology spending. In nominal terms, business spending has fallen to 2011 levels. That’s down -10% from the peak levels in September 2014. Companies are spending from a defensive position. They have dramatically cut capital goods spending, the type of spending that enables future production. And they have been cutting back on basic discretionary spending like travel and entertainment. The capital goods data points to companies seeing flat or falling growth on the horizon. Capital Goods spending peaked in September 2014. Payroll growth peaked shortly thereafter, in February 2015. Next step – payroll growth doesn’t slow, it drops. GM has 200,000 workers making 10 million cars. If sales slow, they don’t need all 200,000 workers. Maybe they could cut payrolls and offer extra shifts instead (fewer workers would cut the healthcare & pension costs). The first thing to get cut is equipment. The next thing to get cut is discretionary spending. The third thing to get cut are payrolls. We’re seeing the third stage now. Ford cut 9,000 workers in October and temporarily idled 3 factories. GM announced they are firing 3,000 workers. GM is also idling one of their plants. Unfortunately, top-lines (i.e. Revenue) remain problematic: revenue growth continues to get revised down. With 85% of the S&P companies having reported earnings, 2016 and 2017 revenue expectations are getting edged down slightly: to 5% 4Q 2016 and 6% for CY17 (per Factset). But in nominal dollar terms, revenues are flat until the second half of 2017. Disciplined spending and hiring will remain in place until companies see a sustained period of demand. CEOs will remain defensive and in a wait-and-see posture until after Chinese new Year in February. Between now and then, companies will run operations lean. Key Takeaway is simple: Through at least the first half of 2017, revenue isn’t growing in dollar/volume terms. So companies will not ramp up hiring. If anything, efforts to squeeze more efficiencies will lead to payroll trimming.